I have been busy this week working on my kitchen with all it lacks. I have come up with a great new project that I think will help a lot with the storage problem I am having. Earlier this week I gave you a peek at what I am dealing with in my post Kitchen Woes. Since then I have come up with a great strategy for dealing with a lot of these problems. My first problem will be to tackle the overflowing pantry problem. I have this huge pile of jars in the garage, I have been meaning to take them back to the bio store but they have piled up instead. Having to haul things down a mountain road by hand tends to make said tasks not get taken care of as often! In the end this was a good thing though because as I stood there staring at that pile I had a light bulb moment. Here I have all these matching jars, they are a good size so perfect for storing things in. Why not put them to good use? And so I am! I just love them! 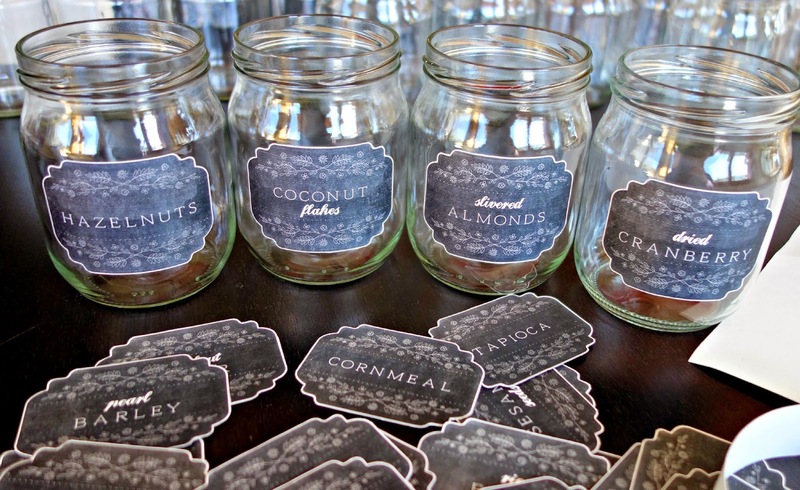 They are perfect for what I have in mind so I immediately downloaded them to put on my jars. I am so grateful for her offering these free on her site. They really are exactly what I wanted. 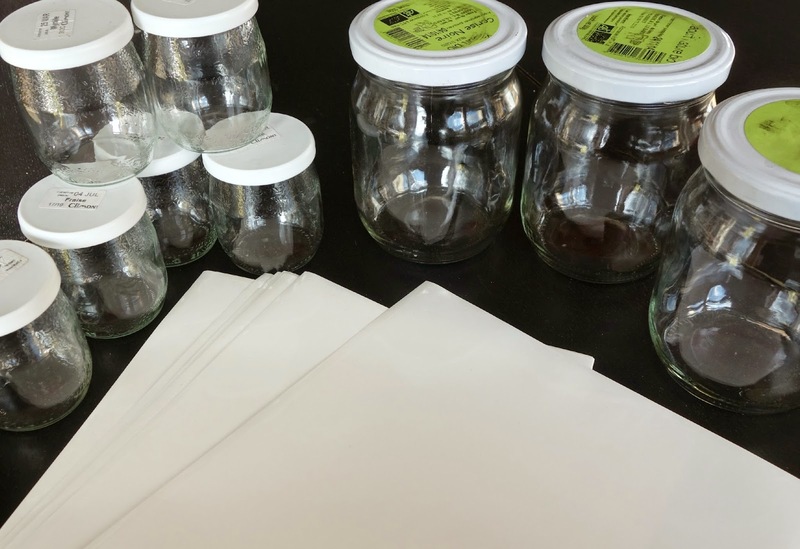 So I printed them out and washed a small mountain of jars and started mounting the stickers. I have these printed on shiny stickers so they will wipe clean easy. Now I am sure they wouldn't hold up to any soak in a sink but they are storage jars that should only need an occasional wipe down. I made a simple guide for mounting them so they would all be the same height. I simply cut a strip of card stock the height of where I wanted the bottom of the sticker to go and taped it so it fit around the jar. Then I just put a jar into the ring and mounted the sticker. Easy-peasy and all the same height! So the first step of my project is completed although I do lack a few jars, guess I better get to eating more yogurt quickly! Stay tuned and I will show you my next step soon. Hope you are all having a wonderful Friday. The weekend is finally here. Want to see what I do next? Here is my post on My new Spice Racks! You've given me some much-needed inspiration to attack our pantry closet. Every time I open it up, something falls on my head! No one else seems to care, but I do and it's driving me nuts! 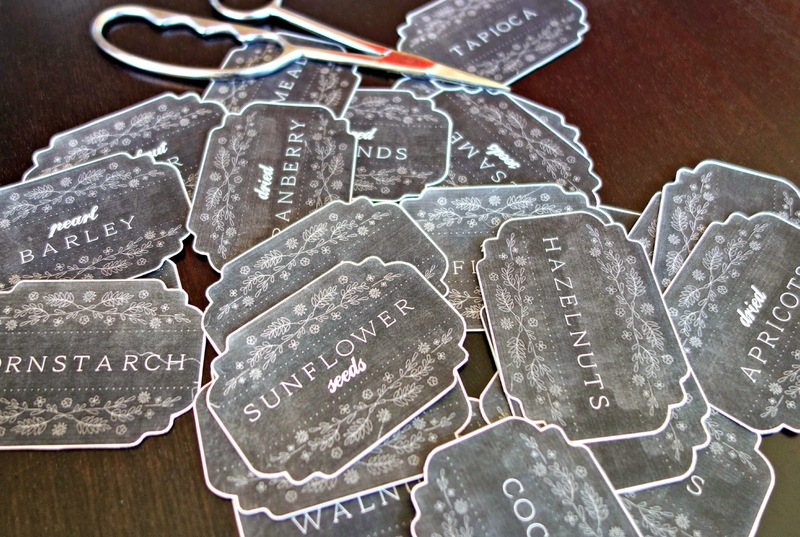 Love those labels, they look almost like chalkboards (one of my obsessions!) Have a great weekend. Kathleen~ I believe the name of these is chalkboard pantry labels so I guess they suit their name :) My pantry is a big old storage shelf, that's it. I can never find anything. Nothing fits on it and it's driving me CRAZY. Every time I cook you can hear me in there grumbling cause I can't find something! I have organization envy! Those labels are so perfect! Your pantry is going to look like a magazine! This is such a wonderful way to get organized and have something pretty to look at at the same time. Thank you for the inspiration! The labels are so lovely!Greets!Storage Malden Rushett Ltd.
OMG, those are so pretty! I'm going to have to check those out and download them. I try to stay organized, but my pantry always ends up with stuff being shoved in wherever I can find a place. These are just lovely! Thanks Tammy, I am really happy with how it is turning out. The difference between this and the hodge podge I had on that old shelf before is night and day!